Dreamy views and a romantic atmosphere surrounded Lidia and Gianni as they tied the knot at Potters Receptions Wedding Car Hire amidst the gorgeous scenery of Warrandyte. Their special day was enchanting and exciting. Potters Receptions Wedding Car Hire was the perfect place for their wedding. Surrounded by beautiful gardens and accompanied by one of JC Jags’ classy cars, the couple celebrated their love in style. Matching their choice of a classic ivory Jaguar, Lidia was the bell of the ball in her stunning wedding gown. Looking like a princess, she fit right into the magical surroundings. Beside the gorgeous car, she looked like royalty awaiting to board a horse drawn carriage. Lidia made her v-neck gown look incredible! Her stylish up-do and radiant makeup complimented her dress perfectly. You’d be forgiven for believing she really was a princess and this was a fairytale wedding straight out of a storybook. Luckily for Lidia and Gianni, it was all real. JC Jags provided the perfect car for the wedding. Lidia and Gianni’s selection fit their wedding perfectly. Their wedding was the perfect mix of class, whimsy, and fun. 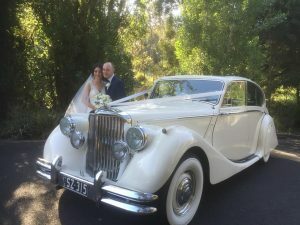 Potters Receptions Wedding Car Hire is the perfect venue for a wedding, traditional, classic cars look stunning amongst all the gorgeous green scenery in Warrandyte.